ETX Capital are a London based broker. They provide traders multiple ways to trade. Primarily a spread betting, Forex and CFD (Contracts for Difference) specialist, they recently added binary options to their offering. Read our full review here. They provide an excellent trading platform. As a UK based CFD broker, they are fully regulated by the Financial Conduct Authority (FCA) Number 124721. At present, the firm offer trading with some of the tightest spreads on the market. The left hand side of the trading platform is the asset and options list. ETX provide the usual mix of assets – Forex, Indices, Commodities and Stock. The lists are extensive, with all major FX pairs covered, such as EURUSD and GBPUSD etc. Popular assets such as gold and oil can be added to favourites lists for ease. On certain binary option types (‘Long term’ for example), the asset lists will shorten as not all markets are available across all option types. On each platform, once the option and asset have been selected, the price graph will update on the right of the screen. From here, the specifics of each trade can be set. So on binary, the expiry can be adjusted, with incremental expiries available, plus ‘end-of-day’ expiry times. Trade size is above the price chart. Where possible, the platform is the same whether trading via MT4, forex on Trader Pro, or binaries. The Call and Put buttons are clear, with the strike price illustrated between the buttons. Once highlighted, trader simply click on ‘Invest’ to confirm the trade. Once open, a trade will appear in the ‘Open Positions’ screen below the trading platform. The price graph will also show the current status of the trade, with a colour sensitive profit or loss figure. In the Open positions window, traders can close certain trades. Binaries offer a ‘Sell’ price, where CFD trades can be closed at any time. The open trades window does show immediately the cost of each trade – though spreads at ETX a very competitive. Fees for overnight charges or rollover costs are low relative to rival firms. Full lists can be found on the ETX website. ETX Capital have demo accounts for the binary options, cfd and Forex platforms. The TraderPro and MT4 platforms each have a separate demo account login as each has subtle differences. These accounts allow traders to check the platform, make sure it suits them and check that all the assets they need are available. It is also a vital educational tool for beginners. The demo accounts are free and do not need a deposit. ETX offer a full range of assets to trade via contracts for difference. These include stock and commodity assets, including bitcoin. Levels of gearing or leverage can be selected, ensuring traders can manage their own risk. Stop losses and stop limits can also be used across a range of trades to further control risk and ensure that margin call never comes. 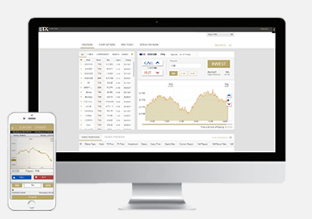 The ETX capital forex platform is offered with it’s own demo account. It follows the same look and feel as elsewhere on the site. Spot FX trading is possible across the full range of major and minor pairs, from the ever popular EURUSD, to things like the Swiss franc (CHF) or Japanese Yen. The spread on leading pairs is as good as anything in the industry, and this has seen many traders swap their old broker for ETX. The mobile app has been separated from the CFD trading app, to focus purely on binaries. Available for Android (v3.0.0 and up) and iOS (iPhone and iPad app), the application delivers the same look and feel as the website, and all of the functionality. All assets and trade types are on offer from the mobile platform, as are trade history and account management features. The binary mobile app is available free to all ETX customers, as are the CFD and forex apps. The download is quick and simple, and traders can login and trade quickly. As a broker that is regulated by the FCA, ETX Capital have strict controls on deposit and withdrawal methods, and this in turn, ensures greater protection for the trader when they add funds. Other payment methods include popular e-wallets such as Neteller, Skrill and Paypal. Withdrawals are a positive at ETX. There is no minimum withdrawal. Bank transfers should be process in 2 or 3 days – withdrawals to a debit or credit card will take a day longer. There no fees for withdrawals – unless traders make of 5 requests in a single calendar month. Any withdrawals over 5 within a month will incur a £10 charge. There is also a £15 charge per month for ‘dormant’ accounts. An account is deemed dormant if there are funds in it, but no trades have been placed over 120 days. The dormant account charge is explained in full in the ETX trading terms and conditions. ETX Capital TV – Trading news, video commentary and features on the ETX entertainment channel.